Double duty deli cases offer the added advantage of two refrigerated compartments. 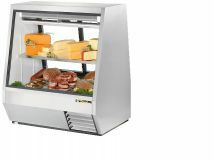 One for display to provide a high profile area for ready to serve deli products under the industry's best lighting and a second lower compartment for convenient bulk storage. Oversized, factory balanced, refrigeration system holds 38 to 40 degrees F (3.3 to 4.4 degrees C). Gravity coil refrigeration system provides high humidity environment for exceptional preservation of meats and deli products. "Low-E", double pane thermal glass front display and rear self-closing doors provide maximum insulation value for greater efficiency and energy savings. Exterior - stainless steel front, sides and back. White laminated rear panel and rear louvered grill.